Tom Holland is an English actor who became known internationally for his portrayal of Spider-Man in the Marvel Cinematic Universe, starting with his debut film Captain America: Civil War in 2016. He has so far appeared in five MCU films. Outside MCU films, he is also known for his roles in Edge of Winter, The Lost City of Z, and The Current War. In 2017, he was awarded the prestigious BAFTA Rising Star Award. Tom Holland was born on June 1, 1996 in Kingston upon Thames, England, UK. Her is currently 22 years old. Holland got educated at Donhead, an independent Roman Catholic preparatory school in Wimbledon, London. He then attended Wimbledon College, a voluntary aided Jesuit Roman Catholic comprehensive school until December 2012. He studied at The BRIT School for Performing Arts and Technology, which was attended by notable stars like Adele, Amy Winehouse, Jessie J and Leona Lewis, among others. Tom is the eldest son of Nicola Elizabeth (née Frost), a photographer, and Dominic Holland, a comedian and author. His father was a regular panelist on the Channel 5 topical discussion series The Wright Stuff . He has three brothers, twin younger brothers Sam and Harry, both are actors and an younger brother Patrick Holland. His paternal grandparents were John Charles Anthony Holland and Teresa Quigleyon, who were born on the Isle of Man and Tipperary, Ireland. Tom Holland is speculated to be dating Englsih actress Ella Purnell after they were spotted together at the BAFTA after party in 2017 and few other occasions. However, neither of them have confirmed nor denied their relationship as of now. Tom Holland made his feature film debut with the Japanese animated film ‘Arrietty’ in 2010, in which he provided voice to the character Shō. His acting debut came in 2012 when he was cast as Lucas Bennett in the 2012 drama film ‘The Impossible’. Tom had a recurring role as Gregory Cromwell in four episodes of the BBC sitcom ‘Wolf Hall’ in 2015.
in Billy Elliot the Musical on the West End in 2008. He gave eight auditions followed by two years of practice before he took the stage. After a few stage appearances, he got promoted to play the title character Billy, which he had played for two years until 2010. Tom Holland got his major break after he played Spider-Man in the Marvel Cinematic Universe (MCU) film ‘Captain America: Civil Wa’ in 2016. Following that, he reprised his role as Spider-Man in the 2017 standalone superhero film ‘Spider-Man: Homecoming’, ‘Avengers: Infinity War’ (2018), and the upcoming ‘Avengers: Endgame’ (2019) and ‘Spider-Man: Far From Home’ (2019). He also did voice roles in a few popular video games. He provided voice of Spider-Man on Lego Marvel Avengers, Spider-Man: Homecoming – Virtual Reality Experience, Lego Marvel Super Heroes 2 and Spider-Man. 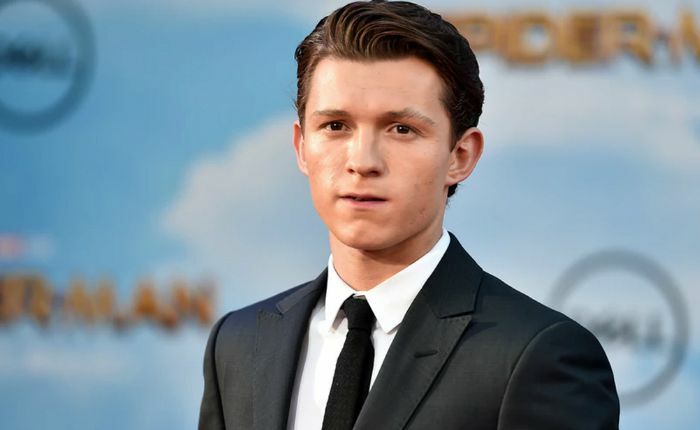 Besides, he earned a lot of application and recognition for his roles as Thomas Nickerson in In the Heart of the Sea, as Bradley Baker in Edge of Winter, and as Jack Fawcett in The Lost City of Z.
Tom Holland has accumulated a net worth of $4 million over the course of his acting career. He lives in the London neighborhood of Kingston upon Thames. Tom began his acting career as a dancer at the Nifty Feet Dance School in Wimbledon. Subsequently, choreographer Lynne Page discovered his ability and gave him a chance to make his debut on the West End, London’s Broadway. Tom has a pet dog named, Tessa. Tom is the only teenager and the youngest actor to ever portray the character Spider-Man at the age of 19. He is also the first non-American to play Spider-Man. He outperformed Timothée Chalamet, Charlie Plummer, Judah Lewis, Matt Lintz and Charlie Rowe for the role of Spider-Man. Tom along with his brothers founded a charity The Brothers Trust, a UK Registered Charity that raises money for various charitable causes. He is a huge supporter of English football club Arsenal. Holland has lent his voice for the characters Walter Beckett and Jip in the upcoming movies Spies in Disguise and The Voyage of Doctor Dolittle. He received several awards for his work in the movie Impossible, including Empire Awards for Best Male Newcomer, Young Artist Awards for Best Performance in a Feature Film – Leading Young Actor and Saturn Awards for Best Performance by a Younger Actor, to name a few. He won the Saturn Awards and Teen Choice Awards for his role in Spider-Man: Homecoming.